I watched Blue Like Jazz for the first time yesterday. It was me, my 18.4" laptop and my Sony studio headphones. I was riveted. I give it two thumbs up, but there's a lot to explain. There's a lot to explain because there's a lot to think about. I've always been the guy to take a hi-fi stereo over a high def TV. But I've got to say, the music and sound ambience were great. Director Steve Taylor is an old time Christian rocker who always had an edgy, gritty sound. He does the music for the movie, too, and it's worth the watch all on its own. I didn't care that much for the dysfunctional Texas church portrayed at the beginning of the movie. It makes a point. I get it. But a healthy, strong, caring church is so different than that. That's the thing: this movie isn't intended as an instruction manual on how to run a church, how to get saved, and how to handle the pressures of college. It's just one guy's story. I get it. I love the Don and Penny talks. The picture of them talking on the bridge in the rain captures the feeling of the movie, and this season of life. Who am I? What does it all mean? And who will be close to me to talk about it? 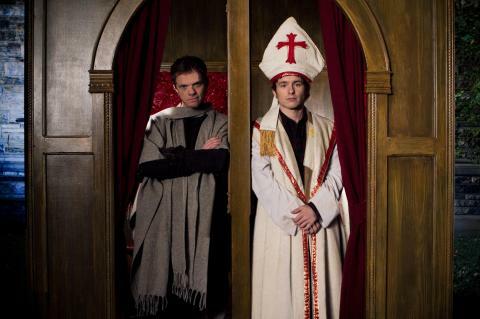 I've got mixed feelings about the confessional booth. It's authentic. I love that. I think that's a good place to start. Do I think that the church should be out everywhere apologizing for all of our quirks? Well, not really. But the image works. Authenticity breaks through our plastic, polished coating that sometimes comes with people of faith or religion. The imagery of the big stone church across the street from the crazy, pagan campus...that works very well. And in general, I thought the priest of that church/parish was represented respectfully. Nothing represented the crazy side better than the brass band in diapers. I can't stop smiling just thinking about the goofiness of it. And that's the point! These people are SO not into God that anything goes! And that is the world that we live in and that our high school grads are walking into. This is actually hilarious to me. 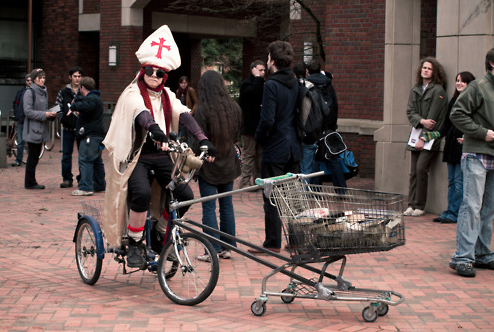 There's a scene where the fake pope rides around with his shopping cart bike and collects everyone's graduation gift books from home to be burned. What's funny is that my book project is exactly in the genre of graduation books. It motivates me to continue my quest to write something really good, and then to be there where the questions are being asked. The movie also uses the whole idea of story. Setting, conflict, climax, resolution. The movie is a story. Each character has his or her own story. Every moviegoer has a story. I think it's true that most of the kids on that campus relate more to a story than to an academic outline of propositions. The movie shoots for young adults who have been turned off by church dysfunction. If you're a "God good, organized religion bad" type, this movie will resonate. If you're an "I hate church and I'm not sure about God" person, you might enjoy the movie for what it is and take away a few things to think about. You won't get preached at. You shouldn't watch this movie if you want to get preached at. It just tells us story, though powerfully so. It leaves most questions unanswered. You shouldn't watch this movie if you don't want an ear and eye full of profanity and sexual humor. Don and Penny are livin' in the real world. The worldly world. So, I want to watch this movie over and over again. I might have to buy it. It's what my blog and book project are all about: reaching out to people asking the big questions in the real world. Have you seen the movie? Do you love it? Hate it? Recommend it? Comments are welcome! I'll chat back. Hey Big W, absolutely! I know that the movie is controversial for some, but I really love people who are searching for God. I even love people who aren't searching for God. I know you do too. This is very real for me. It's where I work. People are amazingly not interested in how church people feel about what they say and think. To me, the movie has a very "Jesus coming to earth" feel to it, mingling with people who needed him. Hi Evan, I read the book several years ago and to be honest I am not real sure how I feel about it. I agree completely with mingling with the people who need Jesus and the fact that the church has done a poor job of this in the past. I am just not sure if this is the way to go about it. I don't think I have to tear down the church to make it happen. I can't change the errors of the past, I can only lead forward. Jon, point well taken that the gospel of Jesus Christ is not about "Hey, we're sorry for all the ways the church has messed up." We have a powerful, positive message of forgiveness and freedom. I don't think this sort of confessional booth is a great pattern for Christian ministry, but it shows a humility with those Christian students...and it certainly got people's attention! I've seen the movie and bought it. I like Don Miller's books a lot. I don't agree with everything he says, nor is my experience like his (I've never really been turned off by church or struggled with some of the questions the characters had), but I do identify with him and the ideas. The movie is authentic. I like it because it doesn't sugarcoat anything. That's the reality believers not only face at college, but also work and our neighborhoods. I'm glad Miller and Taylor addressed it. "Addressed it"...yeah, that's a good way to say it. Life is so real. Conflicting worldviews are so real and when Christian kids hit the college campus they often get the full dose of reality. I think Miller and Taylor have their hearts exactly there: to be there for these kids. That seems incarnational.